Semmle is making its global debut today with a new solution that could help speed up the development of secure software code. The company’s software analytics platform includes a “Looks Good to Me” solution as well as a query engine for preventing software mistakes. In addition, the company is launching with a $21 million series B round of funding led by Accel Partners, with participation from Work-Bench, bringing Semmle’s total funding up to $31 million. The company has also announced that Accel’s Ping Li and Vas Natarajan will join the board of directors. According to Semmle, it will use this funding to serve large technology and financial services companies globally. The platform is already used by top companies and organizations like Google, Microsoft, NASA and Nasdaq. Semmle believes it takes a different approach to securing software by combining object-oriented programming and database logic to solve the problem of making code semantically searchable. 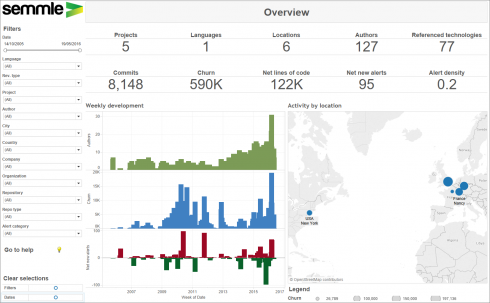 The company’s LGTM (Looks Good to Me) analytics platform will enable developers to better understand their code, processes, and people, by combining deep semantic code search and data science insights from a community of 500,000 developers. LGTM is integrated in a developer’s workflow and provides feedback, recommendations and benchmarking insights, the company explained. LGTM is powered by the company’s query engine QL. QL aims to turn source code into searchable relational data, and uses AI to present actionable recommendations for improvement to developers and managers.